Someone once said: “Better to be approximately relevant rather than precisely irrelevant.” As we see commercial UAS exemptions dripping out of our Federal leviathan bureaucracy, actual remote sensing and mapping applications in the U.S. may become more common. If true, then practitioners (experienced and not) using these new technologies need reminding of some basic truths. Small UAVs are an entirely new platform for remote sensing and mapping. The aircraft, sensors, and software differ substantially from the manned systems used for decades. The techniques used to provide information from remotely sensed data are changing too. 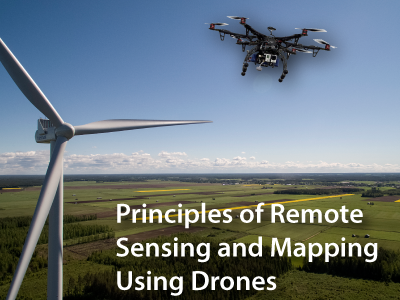 The practitioners who hope to apply these tools to this art and science, the foundational principles of remote sensing and mapping remain unchanged and must be understood to fully exploit these tools and create meaningful deliverables. That said, this author is a remote sensing “professional” and I am describing the application of a transformative technology by innovators. “Professionals” engaged with the “old order” of doing things are often blinded to seeing “the new way”. Therefore, myself and the reader are cautioned to take heart the old proverb: The ark was built by amateurs, but professionals built the Titanic. Many of the sUAS weigh under 10 pounds. Excessive movement of the sensor causes blur in the imagery and maybe holes in the coverage of an area. 15-20 mph winds are a lot. How stable is the aircraft in winds? Are the sensors “stabilized” so atmospheric forces are minimized? There are many applications that will require stabilization in both two and three dimensions. Stabilization can be active and passive. Know what you are getting. It takes time to remotely sense a piece of the planet. Most of the time the project area is distant from our office and travel to the site is required. We call these “small UAS” for a reason. They are tiny and slow. Their sensor footprints from 400’ above ground are quite small. It will take considerable time to capture the entire area. How much area can I cover per hour? How long will it take? 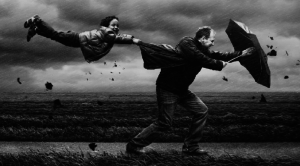 What are my contingencies if I can’t capture the area once I get there because of wind or weather or malfunction? For perspective consider that using manned aircraft today, we can easily photograph 250 square miles in half a day at 6” GSD. Using a small UAS like the SenseFly Ebee we might be able to acquire 1 square mile in the same time. There are economies of scale here that practitioners need to carefully consider. That said, drones have their advantages here. 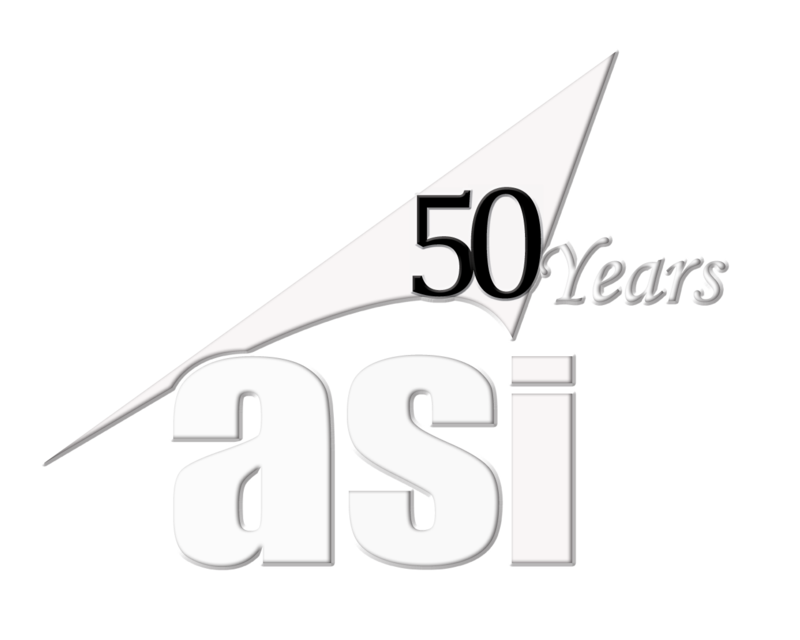 Manned systems can’t typically get 1″ resolution from the air. 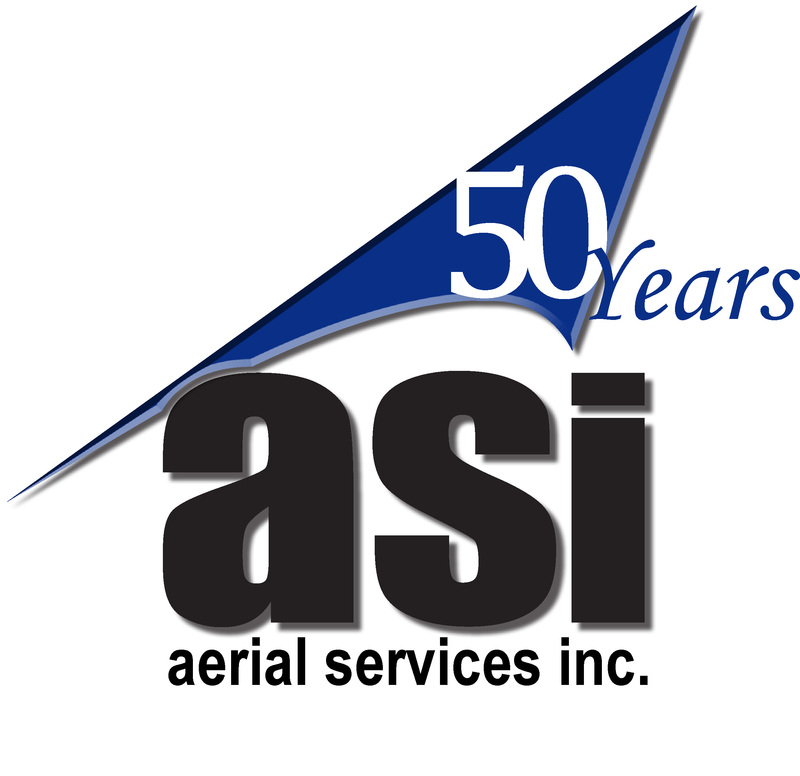 Manned systems require licensed pilots with specialized skills, expensive aircraft and camera systems to fly. Matching this new tool to the right application is key. Without sufficient preparation and training crews will struggle to be effective. Are your pilots and observers trained? Are you carrying all the needed components (drones, computers, batteries, cables) and spares (drones, computers, batteries, cables)? What are the criteria for deciding whether to deploy a crew given certain weather expectations? Manned systems can run for 6 hours or so. 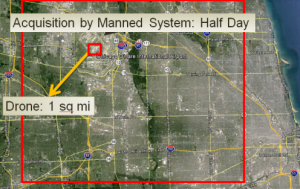 Today’s sUAS typically run on battery for 30 minutes or so (less on a windy day). Many sUAS can remotely sense 100 acres per battery. Recharging batteries in the field is slow. Do you have 3-4 fully charged batteries in the field? Do you need a gas-engine drone? There are requirements for “good enough” and then there are requirements that need a prescribed level of positional accuracy. What is needed? How many ground control points are required to achieve the specified accuracy? Why does this matter? What is the intended use of the deliverables? Many new drone users know nothing about “ground control”. This [and positional accuracy] are a couple concepts that can be ignored only at your own peril. Metric: What is a “metric” camera? Are these important for my application? What are the “costs” associated with using a non-metric camera? What effects will this have on the quality and accuracy of the resulting imagery? Resolution: How big are the pixels from a given altitude (ground sample distance – GSD)? Dynamic Range: Good resolution is often negated by poor dynamic range. Dynamic range is a measure of the camera’s sensitivity to light (higher is better). Look at the images to the right. The image acquired had very high resolution (approximately 1” GSD). But when you zoom into the man lying in the grass, the details of his head can’t be discerned and the reality that he has a head is almost unclear. How can this be with 1” GSD? This is mostly due to poor dynamic range. The time of manned aviation is slowly becoming a dinosaur of it’s age. I believe drones will eventually become smarter, cheaper and better in every aspect. Military drones are already there, but what about commercial ones ? Even today you can find X times cheaper drone with 24h endurance and unlimited range usable for commercial applications. 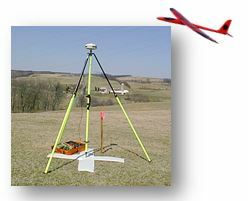 Flying 20m AGL for long range geophysical survey ? No problem, costs per line km speak for themselves. Wind resistance ? Yes, a limiting factor for sUAS class but higher you go, better you get. Unlimited endurance ? Today solar drones are too expensive, but I believe in future costs will come down to Earth. Eventually the only restrictions will be associated with the human limitations. We are getting closer to a fully robotic aviation. As any other tech sector. So what are humans going to do then ? That’s going to be the real question.. I think you’re right, Michal. You are really discussing a time when unmanned vehicles are able to do three things we currently cannot do. first, fly commercially. This will not happen for all practical purposes, for another 1-2 years. Second, is being allowed to fly “beyond the line of sight”. Currently, even with a Section 333 exemption we are allowed to fly only within sight of the aircraft. Third, flying within the national airspace above 400′ AGL. Who knows when this will be allowed and what kind of heavy regulation will be required to operate a bird in these regions? As you indicate, technology is not limiting. As our government grows and our liberties erode, regulation and bureaucracy will be the limiter. Until then, drones will be an important “tool” in our “toolbox” but will not replace manned flight. This could easily be another 10 or more years because as fast as technology advances, bureaucracy slows progress. Mike, you are absolutely correct in much of what you said, currently, for Lidar and high precision mapping and sensing scenarios, the manned platforms are the way to go. You also are on the right track that UAV’s can prove to be a valuable tool in the coming years, and are even now. In a small scale agriculture situation for instance, a fixed wing electric UAV could prove be much more cost effective solution , when you start to look at added maintenance and other operational cost associated with a manned aircraft. in that situation, precision is not as big of a factor when you consider that the images could be collected by two separate camera systems, say one normal SDR, and one modified SDR for NDVI, and that as long as all the images are georeferenced, the software involved seems to have little to no issue building the mosaic, and all the images collected are referenced relative to the rest. This is all my humble opinion of course, as a hobbyist working on getting into the UAV world. Still its pretty amazing that we have come so far so quickly. 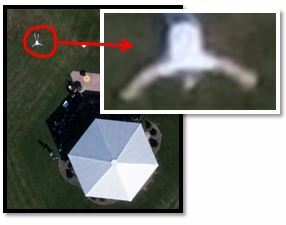 20 years ago if you told someone that you were building a robot plane to fly around on its own and take pictures, and turning them into seamless maps from many different pictures, they would have locked you in the looney bin. haha.